First, I’ll say what didn’t help. While meant to be reassuring, being told to “Just be yourself!” does not help an introvert stricken with stage-fright. I’m great being myself all alone, with my closest friends and family, with my patients, and with acquaintances I know and trust. I can even be the life of the party when the party is comprised of a small circle of friends I’ve known most of my adult life. I’m no stranger to panic attacks. Being “myself” while talking to a complete stranger about the most important thing in my life and having it broadcast into the ether felt like a set up for being reduced to monosyllabic mumbles, unintelligible grunts, or complete silence. Worst case scenario was breaking into a cold sweat and running from the room. Pretending the interview was not going to happen and ignoring the approaching deadline also didn’t work. What helped was being over-prepared. For the next half-hour, the group asked me questions (mostly off-script!) and I answered with whatever came to mind. 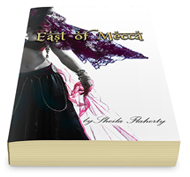 We decided which passage from East of Mecca I should read on the show. I left WCFC feeling really prepared. I jotted down a few notes that had come out in our “interview” and put the script away. Monday, the night before the show, I emailed a notice to everyone on my distribution list telling them about it. Immediately after, I had a total panic attack, took out the script, and re-read it until I fell asleep. On Tuesday, I got up early and walked to the beach. It was a beautiful, warm, sunny day. I walked along the water’s edge imagining I was back in Saudi Arabia. I sat on my stone and meditated and prayed and was grateful for all the wonderful people who are on my team as I bring East of Mecca into existence. Later, I went for a mani-pedi, choosing a rosy-red polish for my toes called “Exposed.” The rest of the afternoon, I gathered my materials together and got dressed. The drive to the studio in Schaumburg was long and rush-hour crowded, but my husband and I made it there early. And then I met Melissa, who was delightful—as smart and warm in person as she has been in all our correspondence. She immediately made me feel comfortable. After the first few minutes of the interview, I relaxed into the role of being “myself.” I talked about my life in Saudi Arabia, my book, and the issue of empowerment—about which I feel most passionate. I never once looked at my notes and the interview went very well. Afterwards, I heard glowing reviews from family, friends, and WCFC. Please visit Melissa Heisler’s The Empowerment Show for more information. Sheila – You were an absolutely wonderful guest! I would say your triumph is the one take video we shot where you had no idea what I was going to ask and you answered it beautifully. So glad you got out of your own way, trusted you knew the material, and in fact had a very lovely and informative chat with me. You were brilliant!